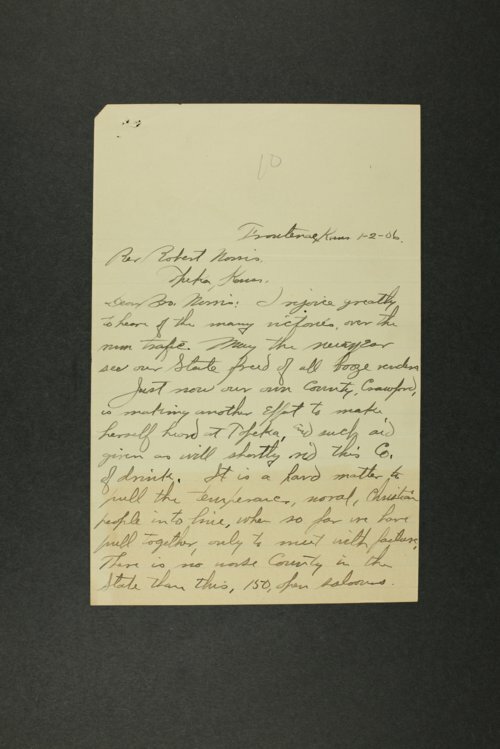 This is correspondence sent and received by members of the Kansas State Temperance Union, including Robert Norris, secretary Topeka, Kansas;, John Marshall, attorney, Ellsworth, Kansas; and Julian K. Codding, attorney, Wamego, Kansas. A letter from H. C. Ericsson, sheriff of Wabaunsee County, lists the names of several individuals that have been "seen drinking." Frequent letters are exchanged with George H. Stuessi, an attorney in Pittsburg, Kansas, regarding legal cases involving alcohol in Girard, Kansas. Although Kansas was the first state to adopt a constitutional amendment prohibiting the sale of intoxicating liquors in 1880, the law was largely unenforced.